Game Boy Advance emulator for the PSP. For emulator is available about 3000 games *.gba or *.bin format. To save space on the memory card, compress images * .gba in ZIP-format archives. Images should be expanded in the folder: "UO gрSP kai \ GBA \ ROM". 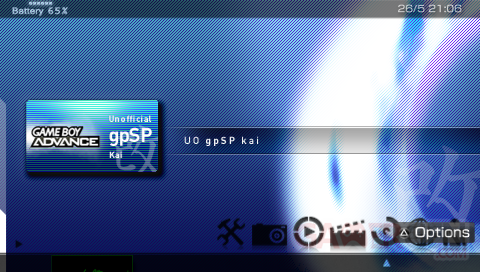 Exophase: main developer - Official release "gpsp" latest v0.9. takka: developer - UnOfficial release "UO gpSP kai" latest v3.4 test 3 build 92.
toBsucht - for testing and helping translating.